plans for his van and where his desire to travel comes from, which is always a great story. My name is Elia. I’m 30 and have recently completed work as a computer technician and am the father of a beautiful little girl named Emily…and I have a “disease.” How many of you are “sick” for travel in all its forms? The one I prefer is on the road, a disease that then breeds the need for hiking, contact with nature, exploring new places, meeting new people and different cultures, photography, and getting lost in the wilderness. As a child growing up in a small country town (in Italy), I always had a strong connection with nature, and at an early age I knew I got along quite well in the wild (the countryside around the house). It all started in 2009 when I decided to drop everything and leave for Australia. I had a stable job with a decent wage, but I was not happy. I decided to try to change the air, travelling “a few kilometers,” and so it was that in October I was on a plane to Brisbane! I landed and adjusted very easily and quickly found work as a dishwasher, a godsend because I could learn a few words of English calmly, and in addition to paying a fare, I had a lot of free time! During my first break I noticed a certain “van traffic”…a lot of guys that chose a lifestyle either out of necessity or as a hobby, living aboard colored vans! The “fuse” was lit in them. In 2011, upon returning from my trip a few years later with the full amount of experience and half-empty wallet and after selling my beloved motorcycle (a 2007 Hornet), I managed to buy myself a fantastic VW van, a T3 with the folding roof half run-down, but with a clear idea of how it would become. From there a restoration lasted two years and a half and the van accompanied me throughout Europe! 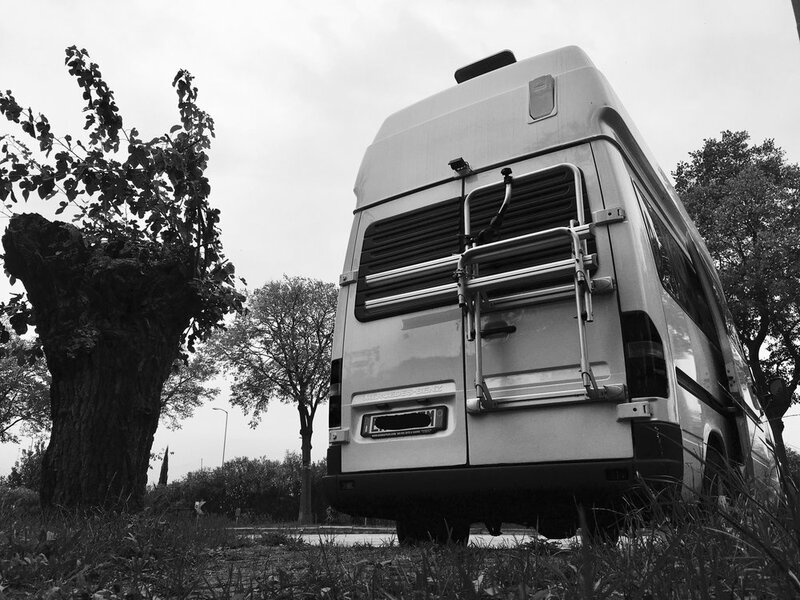 Here in Italy, the idea of living aboard a van is not culturally and legally accepted; people often compare the idea to gypsies, in a derogatory sense, but the damage would be the less. Obviously it is necessary to reckon a bit with the “Italian law,” and will certainly be so in other countries. I will not always be negative towards my country though. I like to think it’s a common issue and is not exclusively Italian! So right now it’s not my way of life, living aboard my van, but in the future I hope so, yes, I’m working for this to happen! I travel for passion because it makes me feel free, and not being tied to a schedule is the goal most of the time. You meet so many people, and you learn a lot of things. I have no degrees and no diplomas, “only” a good wealth of experience and knowledge. Because my parents separated and because of a series of choices and situations, I began to work very early. I did a little of all imaginable works, and I feel quite humble about this. In a job you do with your hands, the garbage man or the administrator, when you look in the mirror feeling well about what you did in your day, you’re at a good point. And if you do not like what you’re doing, trust me, you can always change! new experience, which from my point of view is much more fulfilling. But in the future you never know. This is why I have made my website and social page…to share, in the nicest sense of the word. By sharing who I am, what I like to do, photos, excursions, trips and adventures around Europe, I hope to inspire in people, who maybe for some reason are unable to do so themselves, the desire to travel. Because travel is for everyone, and you can travel often for very little money with the help of a van, camper van or small RV. There are often misconceptions, and sometimes it is the wrong approach for a trip. If you intend to travel and stay a week in a 4-star hotel with your family, you have many desires. But I think if you liked this type of trip, you would not be here reading this. So what are you waiting for? If you already have the means arranged, switch on even if just for a few days. If not, why not consider the purchase of a van! I changed her life, and it was perhaps the best investment ever made in my life! There are many travel blogs, and they are all different. Apart from the goals, each has its own story to tell! In February 2017, I will leave on my adventure for twenty days to hunt the Northern Lights in the van! From Lapland precisely to Ivalo! Nature, snow, solitude, fantastic places, beautiful people, fantastic emotions…and Aurora Borealis! There are many changes I have to do to the van to optimize it! This is just the first in a long series of adventures through Europe! Follow along with Elia and the Van Adventures on Facebook or his website, which is currently in Italian, but he assures us, English soon!